When I first heard people were eating Tide pods, I thought it was a joke. 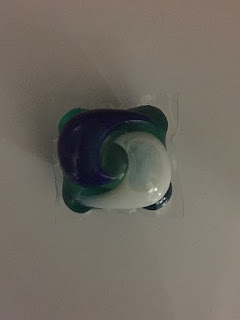 I had seen the eating Tide pods meme on Reddit, and I thought I understood the joke, which is that they look delicious. A few weeks later, when one of my Facebook friends posted a status lamenting the younger generation’s eating of Tide pods, I assumed it was one of those things like rainbow parties or poisoned Halloween candy – i.e., not something that ever actually happens, but that people freak out about anyway. But no, it turns out kids are actually eating Tide pods. It’s called the Tide pod challenge, and knowing about it adds a whole new layer of humor to the meme. Image by Soulbust from Wikimedia Commons. Apparently, the Tide pod challenge involves filming yourself biting into a Tide pod. I thought, it’s only soap, it can’t be THAT bad for you, can it? It can. The super-concentrated ingredients in Tide pods will burn your stomach lining if you swallow the pod or its contents. There’s probably not enough poison in one Tide pod to kill an adult, and you’ll probably only need to spend one night in the hospital if you eat one, unless you aspirate some of the detergent into your lungs, in which case you’re probably going to die. Plus, there’s the taste. I’ve never tasted laundry detergent, but I can’t imagine it tastes nice. Actually, I can. That’s the problem. I was so surprised when I heard kids were eating these as a challenge too. It is disturbing that people will eat these knowing that they are soap. Even though they are squishy and colorful, I would never be tempted to actually eat one of them, maybe squish it, but that is about it!